Need help building a deck? Here it is, broken down! If you've been investing any time in Skylanders Battlecast, you've likely been studying good strategies and best practices for creating your own decks. Crafting your own deck is crucial for performing well in-game, but how do you go about doing so? Creating a deck is very simple, actually. You can create and store nine decks within the Battlecast app, so you've got plenty of room to try new strategies out and see what works. To start creating a deck, go into the Battlecast app and open up the Collection. Find "New Deck" under "My Decks," and then choose three Skylanders for the three slots that open up. Drag and drop your cards into the blanks, then choose "Done." Once you've opened up the deck-building procedures, pick up to 30 different Gear, Spell and Relic cards that you'll see on the right side of the screen. This is where things can get difficult. You can only choose from elements that match the Skylanders you chose at the beginning of this process for the deck. Any cards that aren't tied to elements can be used no matter which Skylanders you use, however. You can choose up to 30 individual cards, but if you decide not to go up to this limit, the game will fill up the rest of the deck with random cards. Make sure you've got some cards you actually want in the deck because of this clause. You can choose "Autofill" if you want to do this automatically instead. Once you're done, you can give your deck a name by tapping the "New Deck" button at the top right of your screen. Once finished, give everything a look over and save your deck. It's now ready to take into battle! 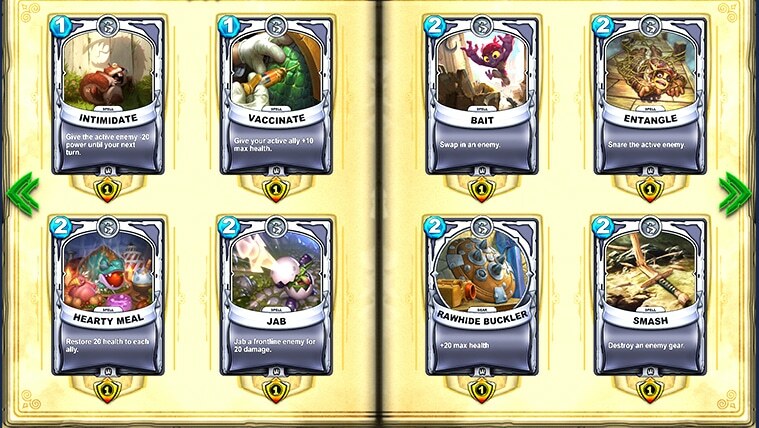 If you find yourself in need of new cards, there are several ways to obtain them, as previously detailed in the last Skylanders Battlecast guide. You can earn in-game coins to buy digital booster packs, pick up physical card booster packs to scan in to the app, or even buy digital card backs with real money via the App Store of your choice. There are several different ways to obtain additional cards, but you don't always have to spend money to do so. And you can make the best of the cards you have, if you know how to build decks correctly. Armed with the knowledge of how to put one together, you'll be ruling the leaderboards in no time!